Simple, elegant, and oh, so sweet. 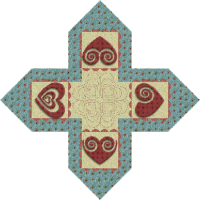 This lovely criss-cross table topper will give you a chance to play with color - use bright reds to celebrate Valentine's Day, or soft pastels to use all year round. 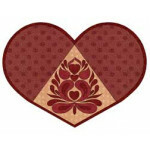 Perfect for a romantic Valentine's Day dinner, there's no need to limit using this elegant placemat .. Pull out your lovely pink and red florals and showcase them in this project. Make this your own uniq..